This temple is situated at the Chinmaya Vidyalaya, Vadavalli, Coimbatore and was consecrated in the presence of Pujya Swami Chinmayananda. The school children start their day invoking the blessings of Gnana Vinayaka. Daily puja (twice a day) is carried out at the temple. 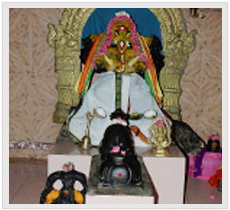 Ganapati Homa is performed twice a month on Chaturthi days and on auspicious occasions. Throughout the months of Margashirsha (approx Dec 15 - Jan 15) abhishekam and specific pujas are done by the devotees.